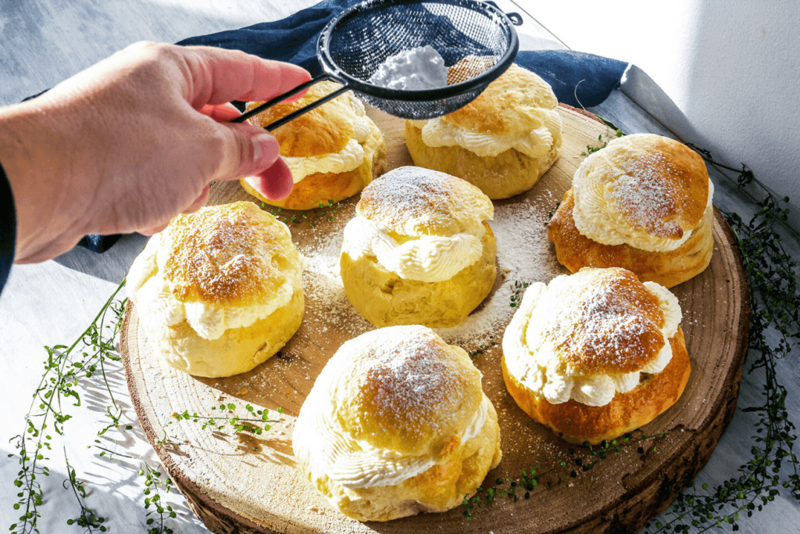 The semla is a classical Swedish pastry that is served on Shrove Tuesday. Now days even before. But it used to be served as treat after fast. 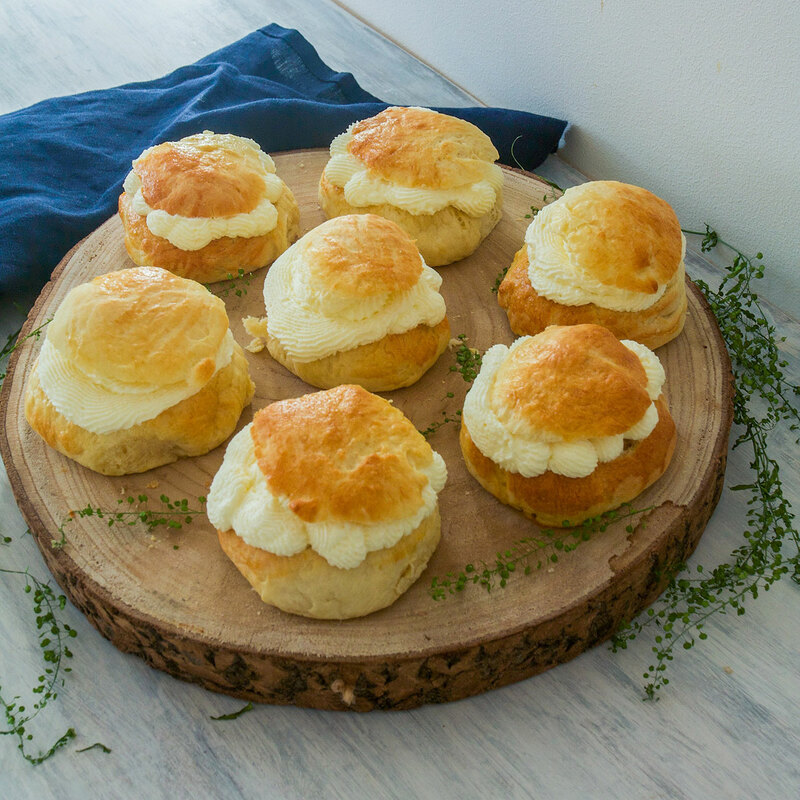 During the last couple of years the Semla, whether a vegan semla or not has popped up in many shapes and flavours. As you probably know by now I love experimenting with new flavours and play around with textures. The semla, however, is one of those absolute classical pastries that I love just the way they are. I can go as far as a vegan semla, which really is just the way the classical one is. Just allergy friendly. I can even stretch as creating a fusion between the French and Swedish. And name it a petit-choux semla. But that’s how far I’m willing to take it. I have always loved the semla, except for a quite an extensive period when I couldn’t eat whipped cream. This was because I overate whipped cream. When my grandmother was baking I stole the bowl with the whipped cream in it. Consequently, I was really ill. And just the look of whipped cream made me sick. I was devastated. A lot of Swedish pastry is filled with whipped cream. 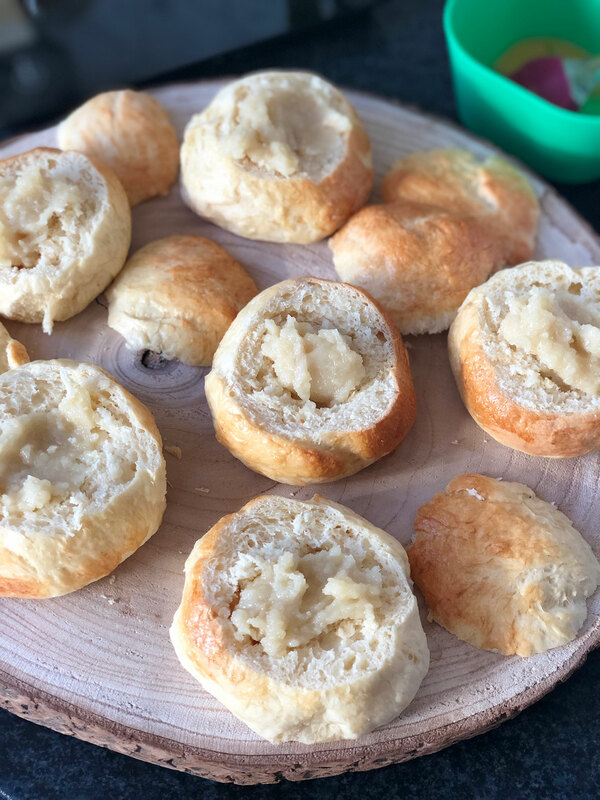 Even though wheat buns are fairly easy to make they can easily become too dry and crumbly. Really use lukewarm fluids to resolve the yeast. Otherwise it can have a negative effect on the rising process and as a result, your bun might get dry or hard. Your oven shouldn’t be too warm. This can cause the buns to get burned on top but still undone in the middle. When in doubt let the dough rise a little bit longer. 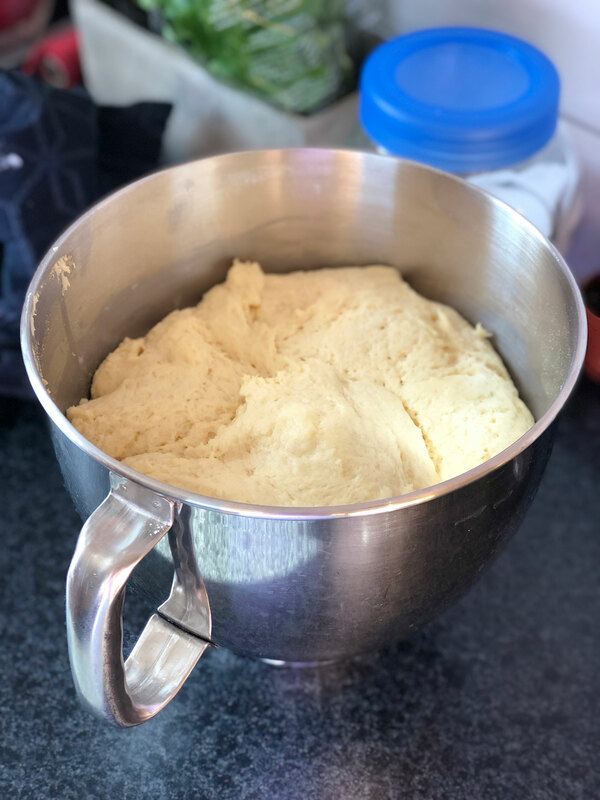 If the dough is covered you can leave for a longer time to rise. Never ever let the dough rise in a cold or drafty place. It will not be good for the end result. If you can let it rise on top of the oven or a place you know is warm. Also, don’t knead the buns too much. They tend to become very hard. This is because you knead out all the air. And becomes less fluffy. 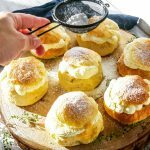 The semla is a classical Swedish pastry for Shrove Tuesday. This is a vegan version of this insanely simple yet delicious Winter dessert. Melt the butter in a pot. Add the milk and heat until lukewarm. Crumble the yeast in a bowl. Add the milk and butter mixture. Stir until the yeast is completely resolved. Add agave syrup, salt, cardamom, and the flour. Knead the dough until firm and glossy. Cover the bowl with a clean tea towel. Let it rise for 40 minutes. 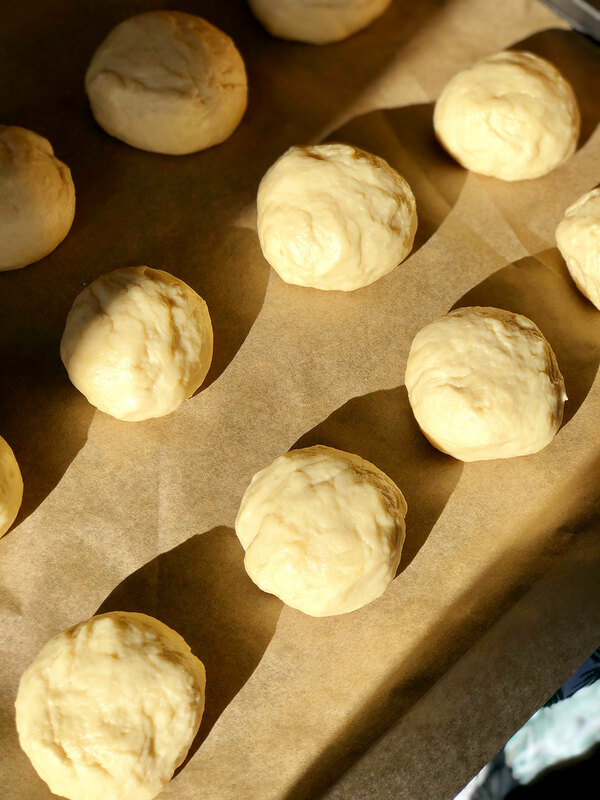 Roll the dough and cut into 12 slices. Shape them into balls. Place them on a fitted baking tray. Cover with a tea towel and let them rise for another 40 minutes. Set the oven to 200C/fan. Bake in the middle of the oven for 7 minutes. This can vary depending on your oven. 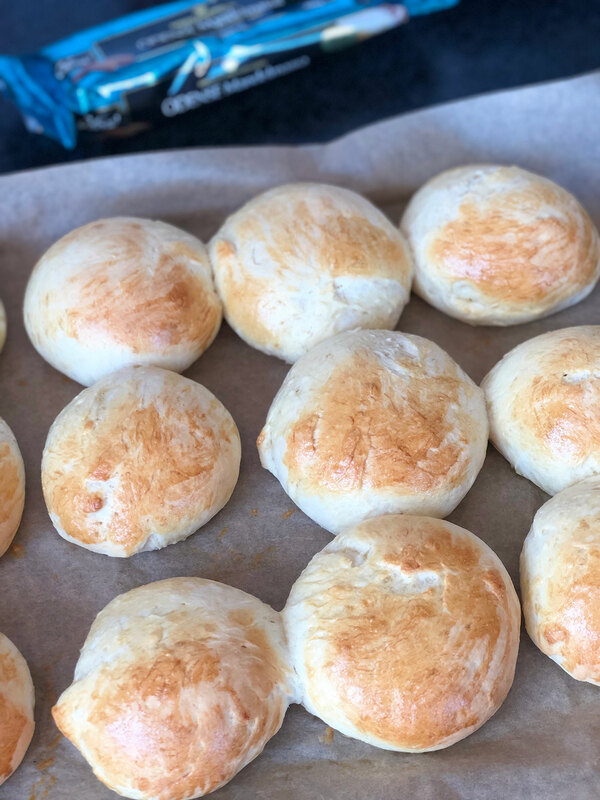 So keep an eye on the buns first time you make them. They should be slightly golden brown on top when ready. Take them out and let them cool completely. Grate the almond paste and mix with the almond milk. Mix until smooth. Cut the top off the bun and scoop out a little bit of the bottom part. Pipe the almond paste into the little hole in the bottom part. Whip the cream and pipe each bun and cover the almond paste. Put the top on and dust with icing sugar. Done.